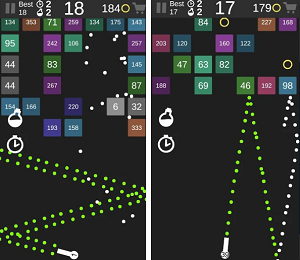 Gravitational is an Android game that is currently trending in the puzzle category because of its amazing simplistic gameplay that will get you hooked from the very start. It requires skills, logic and little luck if you want to pass through all of the different obstacles that come through. The game has simple story, you are a blue square and you need to pass through the obstacles using different gravity. The gameplay of the game varies with the level you are on. That makes the game interesting and so broad. In that way we are sure that you will never, ever, get bored with it. The game levels can vary from you in between black squares, or circles, or lines, or red dots attacking you.. it can be anything. It has 1 touch control and it is very smooth on both tablet and phones. To make things more interesting the game features Leaderboard. So, you will have additional motivation to always do your best with the blue doth. The game is very original, interesting and exciting. It is totally free to play and you can get it on Google Play. We can easily say that Gravitational has the potential to become the new hit in the Puzzle game category on Google Play.